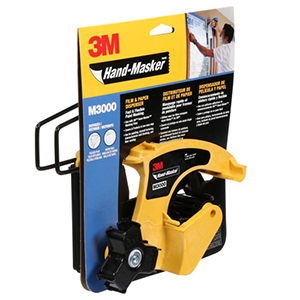 The 3M 10.8-by-9-by-3.6-inch hand-masker masking tape film dispenser is a compact and lightweight dispenser that applies masking tape to masking film up to 144 inches wide or paper up to 18 inches wide in one continuous application. Ideal for professional heavy-duty use, this dispenser will save you time preparing for painting, ceiling texturing, exterior wall finishing or floor sanding. The dispenser feeds tape and paper directly to work surface and requires no oiling or maintenance.